The ongoing freesurfing vs. competitive surfing debate is one that I’m sure will never end. There are legitimate points to be made on both sides of the fence, but the fact of the matter remains that there will always be differing views on whether surfing was ever meant to be a competitive sport when it’s founding fathers first took to the waves. Whether you’re a fan of competitive surfing or not, the inception of surfing as a professional sport and the staggering amount of money it has generated has gone a long way to allowing surfing to progress and come as far as it has. The world’s best surfers are now rewarded handsomely to do pretty much nothing other than constantly surf the best waves around the world, thanks in large part to Mark Richards, Rabbit Bartholomew, Peter Townend, and Ian Cairns, as well as Shaun and Michael Thomson. While they weren’t alone in laying down the groundwork for professional surfing, they were certainly instrumental and vital figures in the process. And it was the story of these six surfers that is beautifully told in Bustin’ Down the Door. 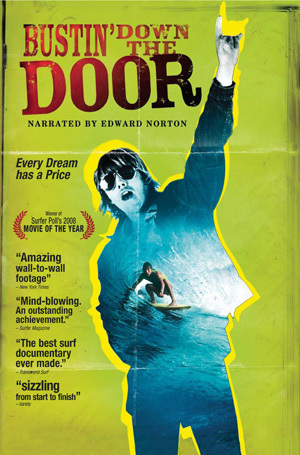 Most within the surfing community are familiar with the basic story in Bustin’ Down the Door. A group of surfers from Australia and South Africa began making the trek to the Hawaiian Islands in the mid 1970’s and took the North Shore by storm. Determined to make themselves seen and heard throughout the world, a few of them began running their mouths and thumping their chests with no regards to the local people who called Hawaii their home. The result was a few brutal rounds of dirty lickin’s for the crew of foreigners, but order was eventually restored and in the process came the birth of professional surfing. Sounds pretty basic, right? But what makes Bustin’ Down the Door such a special film are the stories within the story. There’s the emotional confession of a man who is now the current head of the ASP, Rabbit Bartholomew, that as a young man he became so desperate to put food on the table that he resorted to stealing. You also gain a better understanding for what type of men Clyde and Eddie Aikau were and still are, and also see just how much of an influence that they and their family had in restoring order to the North Shore. And then there’s finding out that the trophy Pete Townend received from Fred Hemmings for winning the inaugural world title was actually borrowed from the Outrigger Canoe Club. Hearing and seeing the stories of each individual and what they went through in this time period is a priceless and enjoyable experience. The DVD will be in stores January 13th. Posted by Shaun	on Friday, January 2nd, 2009	in Surfing.